Around 3.26 billion years ago — long before the dinosaurs — a massive asteroid measuring nearly 36 miles (58 km) across smashed into the Earth. Geologists have now reconstructed this cataclysmic event, and it was far, far bigger than we thought. Here's how things went down on that fateful day. Thanks to geophysicists Norm Sleep and Don Lowe, here's what we now know. The impactor itself was somewhere between between 37 and 58 kilometers (23 to 36 miles) wide. That's about the width of Rhode Island and about three to five times larger than the asteroid thought to have wiped out the dinosaurs. When it struck the Earth, it was moving at 20 kilometers per second (12 miles per second). The collision instigated a planetary-wide earthquake measuring more than 10.8 on the Richter Scale. It propelled seismic waves hundreds of miles through the Earth, breaking rocks and setting off other large earthquakes. This earthquake shook the earth for a half hour — about six times longer than the one that struck Japan in 2011. The event also rebooted parts of the Earth's tectonic system. According to Lowe, who's studying geological features in a South African region known as the Barberton greenstone belt, the impact initiated the modern plate tectonic system that's now seen in the region. This is the first study to model an impact that occurred more than 3 billion years ago. It also triggered tsunamis thousands of meters deep — far bigger than anything that could be generated by conventional earthquakes. These tsunamis swept across the oceans that covered most of the Earth at the time. The resulting crater was 300 miles across (500 km) — about the distance from Washington, D.C. to New York City. The Earth's surface was completely fried. The sky became red hot, the atmosphere was filled with dust and debris — and the tops of the oceans boiled. 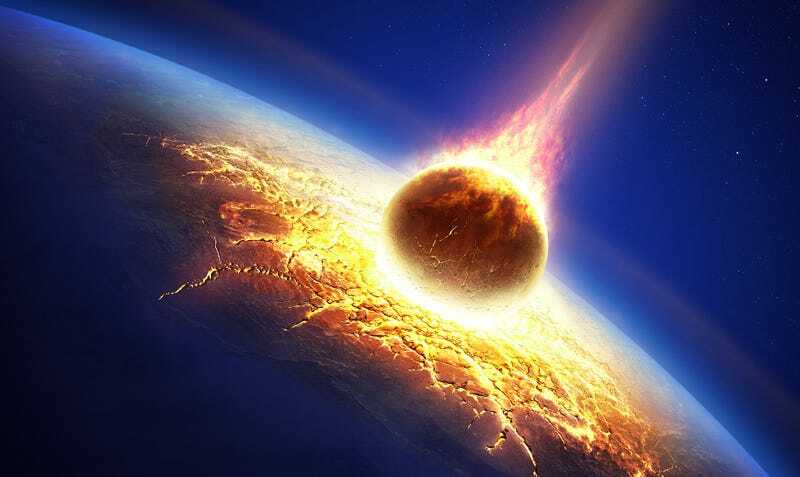 Vaporized rock was shot up into the atmosphere where it circled the globe and condensed into liquid droplets before solidifying and falling back to the surface. The scientists say the event could have been one of dozens that struck the Earth during the tail end of the Late Heavy Bombardment period. Since that time, many of the impact sites have been covered as a result of erosion and other natural processes. But the geologists have found a number of areas in South Africa and Western Australia that contain evidence of the impact. Their best guess is that the asteroid struck an area thousands of kilometers away from the Barberton Greenstone Belt. Read the entire study at Geochemistry, Geophysics, Geosystems: "Physics of crustal fracturing and chert dike formation triggered by asteroid impact, ~3.26 Ga, Barberton greenstone belt, South Africa." Additional information via Stanford University. Images: Johan Swanepoel/Shutterstock | Stanford/Lowe&Sleep.